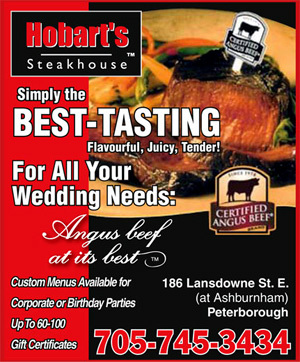 Hobart’s is licensed to serve the Certified Angus Beed® brand. Less than 8% of beef is flavourful, tender, and juicy enought to meet the brand’s standards, so enjoy the best beef today. 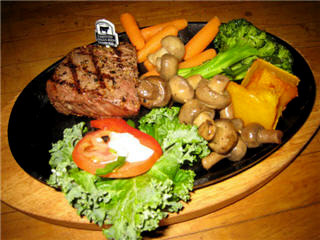 We prepare all of our steaks to your liking on our famous sizzle platters. Our Certified Angus Beed R steaks are served with sauteed mushrooms, house butter and vegetables as well as your choice of twice-baked potato, roasted potatoes or freshcut fries. Your choice of one of our side salads or soup is included. Dr. hobart F. Peters spent ihs career in animal research; a quest for the best cattle production. The steks served at the restaurant that bears his name are the finest anywhere. If Hobart was with us today, we’re certain he would agree. From day one the steaks have been Certified Angus Beef® brand; beef so good that only 8 out of 100 cattle graded are good enough, resulting in steaks that are naturally tender, juicy and flavourful. To compliment the steak selections, Hobart’s offers a variety of salads, chicken, seafood and pasta dishes, all made fresh to the same high quality standard. The service at Hobart’s is friendly and professional. The staff certainly takes the promise to deliver caring, hospitable service seriously. 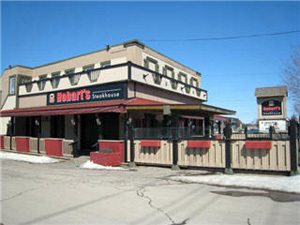 Hobart’s Steakhouse is a favourite destination for couples or groups of 4 to 50 or more, and the summer patio is a perfect place to unwind and enjoy fabulous food and drink with friends. Call and reserve your table or drop by and see for yourself why our guests always come back for more.